I hear a lot of talk, these days, about how important it is for organizations to establish a sustainable culture of innovation. I agree. It is important. The key is to close the gap between the hot talk on the topic and execution. It's easy to wax poetic about "culture change." It's quite another thing to effect it. Cultures take years to form... and they take years to change. That being said, the effort to do so is a noble one and worth your time. And so, to help you focus your efforts, here's Idea Champions' list of 50 things you can do to foster a culture of innovation. 1. Remember that innovation requires no fixed rules or templates -- only guiding principles. 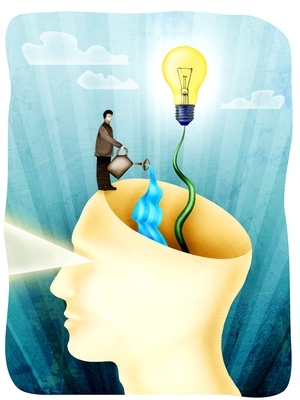 Creating a more innovative culture is a creative act. 10. Ensure a high level of personal freedom and trust. 12. Instead of seeing creativity trainingas a way to pour knowledge into people's heads, see it as a way to grind new glasses for people so they can see the world in a different way. 25. Select and install idea management software for your intranet. 46. Reward collective, not only individual successes, but also maintain clear individual accountabity and keep innovation heroes visible. "I wish I had drunk more champagne." With these last words, John Maynard Keynes, the famous British economist, passed into the Great Beyond. Way to go Johnny! Conrad Hilton, grandfather of Paris and founder of one of the world's most acclaimed hotel empires, left us with a slightly different message. "Leave the shower curtain on the inside of the tub." Thank you, Conrad. I will do my best to remember that. What about you? What do you imagine your last words will be? Or better yet, what would you like them to be? Oh sure, you may have lots of emails to answer, spreadsheets to read, and meetings to attend... but it's never too soon to get your legacy in gear. Setting a clear intention is not only important for business, it's also important for LIFE. Got it? Good! Now share it with the rest of us. When four or more submissions are received I'll post them here for everyone to read. And soon thereafter, Idea Champions' esteemed panel of imperfect judges will bestow one lucky reader of this blog with the FIRST ANNUAL LAST WORDS prize (a copy of the book from whence these quotes were quoted). Should be interesting. 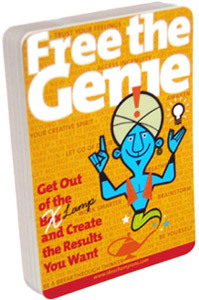 Tired of rubbing that magic lamp you bought on ebay, hoping for a genie to appear? Need a big breakthrough on a project of yours? Look no further. You've come to the right place. And you won't need to rub a single thing. All you need to do is click.But first you'll need to think of a venture or idea you really want to get off the ground. Got it? Good. Now click here and let our online genie help you on your way. I have an odd ability to come up with ideas for other people when I'm not really trying. Book and song titles are my specialties. Often the ideas are so intriguing, I try to convince myself to do something with them, but eventually I realize they belong to someone else. The question, of course, is WHO? Usually I don't know and the ideas end up orphans. But now that I've got this blog thing going, I've got a way to share the wealth -- or at least a few chuckles. So, here goes:Book title for a psychic: I Thought I Was a Small, But I'm a Medium. Book title for a psychologist with an Eastern bent: Yin, Yang and Jung. Title for a song for a recovering alcoholic: 50 Ways to Love Your Liver.Go ahead. Take 'em. They're free. 78% of all people who log onto the Idea Champions website spend less than 30 seconds there. It's probably the same for this blog. Short and sweet is the name of the game these days. And so... for the rest of the summer, all our blog postings will take you less than 30 seconds to read. The one you're reading now has taken you about 23 seconds so far. Which means I have another 7 seconds or so to say something meaningful.